The Corps Marshal of the Federal Road Safety Commission (FRSC), Boboye Oyeyemi, has approved redeployment of some senior officers to step up effectiveness of the commission. The Head, Media Relations and Strategy, FRSC, Bisi Kazeem, disclosed this in a statement in Abuja yesterday. He said “Affected principal officers include: Mr. Austin Aipoh, Head, Command Administration and Strategy at the headquarters to replace Mr. Stephen Maitizumahs at Zone 11 Osogbo, who will now head Manpower Development(MPD), FRSC. He added Zonal Commander, Zone 1, Kaduna covering Kano, Kaduna, Jigawa and Katsina States, Victor Nwokolo, is now to head, Command Administration and Strategy, FRSC headquarters while Mr. Bitrus Darwang of Zone 6 now to command Zone 1 consisting of Kaduna, Kano, Jigawa and Katsina sector Commands. Others affected are some Zonal Heads of Operations, Zonal Administration Officers and Unit Commanders among others. 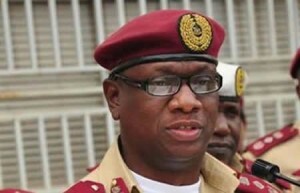 The redeployment letter by Corps Secretary FRSC states that affected officers are to report in their new commands on or before May 17 after proper handing and taking over. Previous Man Kills Wife In Domestic Dispute!